It is helpful to understand the model data structure before trying to create a model. A model is basically a collection of points that refer to or mark interesting locations in an image. These points are stored in groups that are called contours. In the simplest case, a contour is a closed boundary around a region in an image. However, you should think of a contour more generally as a set of associated points, which may or may not be connected by lines. You will typically want to keep track of more than one type of feature in an image. This is facilitated by allowing contours to be grouped together into separate objects. Each object can be given its own name and all contours in the object share common attributes such as color and line thickness. This table shows how objects, contours, and points are organized in a hierarchy in the model. includes pixel size, Z-scale, and information relating model to image coordinates. To create a model for a MRC image file called example.mrc run the following 3dmod command. This command will cause a new model to be created, ready to edit. When this command is run a window similar to the one below will open up. A secondary window containing the image of the image file and model file is opened after the data has been loaded. Note that the files used for the examples shown below, dual.rec and example.mod, are among the sample data files available from our web site. The 3dmod Information Window above is the main control window of the program. It contains menus for performing file operations, selecting model editing functions, and opening various kinds of image windows. It displays information about the model and the current image point. There are also some controls that govern the overall behavior of the program, and a status pane where messages are printed. Let us consider it from the top down. The title bar of the Info Window shows the name of the image file and also contains controls for minimizing the window or closing it, which is a quick way to exit the program. Below the menu line are some buttons that control window behavior, with the name of the current model file shown on the right. The peg button allows you to keep the Info Window on top of windows from all other programs. The raise button (two up arrows) will bring all of the windows of the current 3dmod above windows from other programs. The buttons with the curved arrows will undo or redo changes to the model. The "Show point" button will be explained in a moment. Below these buttons are a set of controls called spin boxes, which are used extensively in 3dmod. A spin box shows a current value of some parameter, and lets you change that parameter either by increasing or decreasing it with the up and down arrow buttons, or by typing in a new value. The three spin boxes on the left show the current model object, contour and point, as well as the color of the current object. The model being edited above has 4 objects; the 4th object is currently selected. The 4th object has 11 contours and the 5th contour is currently selected. This contour has 20 points and the 10th point is the current point. Generally, when you change object, contour, or point with one of these spin boxes, the program will show the new current point in the image windows and change the section being displayed if necessary. Sometimes you will not want this to happen, such as when you want to switch between objects without having the displayed section change. In that case, just turn off the "Show point" checkbox. The three spin boxes on the right are the image position controls. They show that the image dimensions are 572 by 378 and that there are 31 sections. The current image point is at the location (237,259) with the origin at the lower left corner of the image. The current section is number 16. If you change the Z value, a different section will be shown in image windows. You can change X and Y values to move the current image point. The current image point is not the same as the current model point. It is marked by a cross when the program is not in model mode, and it determines what coordinates are displayed in some of the image windows. At the bottom of the Info Window are the Black and White sliders, which you can use to adjust the contrast and brightness of the displayed image. Pixel values between the selected black and white levels (151 and 239) are stretched out to occupy the full dynamic range of the display. Moving the sliders toward each other will increase contrast, while moving one or both to the left will increase brightness. These sliders have features common to nearly all of the slider controls in 3dmod. Clicking to one side of the handle with the left mouse button will change the value by one. Clicking with the middle mouse button will jump the slider to the position of the mouse pointer. Dragging the handle by clicking and holding the left mouse button will cause the image contrast to be continuously updated until you release the button. In other words, these sliders are continuously active, or "hot". Sometimes the program will not perform well when a slider is continuously active, such as with very large images or models. You can keep a slider from being hot by holding down the Ctrl key (Apple key on the Macintosh). When you do this, the numeric value will be continuously displayed but the image will not be updated until you release the slider. Below the sliders are several controls related to setting the contrast. When the "Float" box is checked, the program will adjust the black and white sliders automatically when you change from one section to another in an attempt to maintain a constant contrast and brightness between the images. The "Auto" button is for setting contrast automatically; when you press it the program will adjust the black and white sliders so that the displayed image has a defined mean and standard deviation. When it starts up, the program will set the contrast in this way for the first image that it displays. The settings for the target mean and standard deviation can be changed in the 3dmod Preferences dialog box, available from the Edit-Options menu entry. For example, you could increase the target mean to make images brighter, or reduce the standard deviation to make images have less contrast. When the "Subarea" box is checked, both the "Float" operation when going between sections and the "Auto" contrast-setting operation will be performed using only the image area displayed in the Zap window. The "Movie" and "Model" radio buttons allow a user to select one of the two modes. When "Movie" is selected, pressing the middle or right mouse button will cause the image to movie back and forth. When "Model" is selected, the three different mouse buttons will edit the model, as described below. The bottom panel of the Info Window contains additional information and status messages. You can expand the window vertically to see more of the information at once. 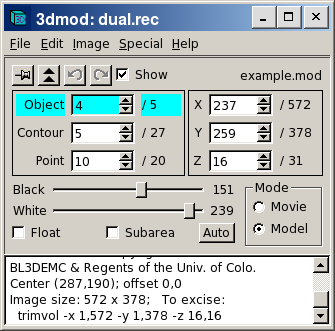 The main image display and model editing window within 3dmod is the "Zap" window. The window name is an acronym for "Zoom and Pan". The zoom can be adjusted by clicking with the left mouse button on the arrows at the left side of the toolbar. Alternatively, one can zoom up and down with the "=" and "-" hot keys, respectively. To pan the image when it is larger than the window, press and hold the left mouse button in the image area of the window and drag the image. This display of two nearby slices from a tomogram (sections 20 and 16) illustrates the three kinds of model objects: closed contours, open contours, and scattered points. Closed contours are used to draw closed boundaries around features in one image plane. The light blue lines following the membrane around a vesicle are an example of closed contours. As the two different slices show, a separate contour is drawn in each section where the feature appears. You can draw as many separate contours as necessary to enclose the feature belonging to an object on one section. After you have drawn the model, you can connect the contours across the sections and create a surface that can be viewed; this operation is described below. Closed contours without point symbols are the default when a new object is created. The contour in section 16 does have some circles drawn on it because it is the current contour. The first and last points of the current contour are highlighted with green and red circles, while the current point has a yellow circle drawn on it. Open contours are used when the end of a contour should not be connected back to the starting point. There are two cases where this is useful. If only part of an extended feature in present in the images, you would draw an open contour in each section along the boundary of the object. 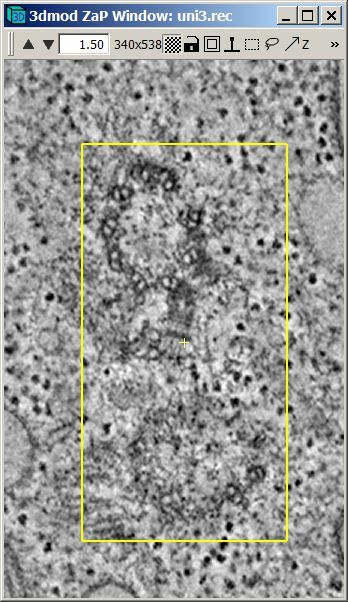 The yellow lines in the images are open contours showing the border of the darkly stained chromosome. The other main use is to model trajectories in 3D, between sections. In the example images, open contours are used to model microtubules through space, and the points are marked by green circles. Open contours are also used to track gold fiducial particles through a tilt series. Scattered points are used when you do not want connecting lines between the successive points of a contour. Such points are usually displayed as a sphere in a 3D view of the model, or as a circle in cross-sections such as in the Zap window. In the example, a small round vesicle has been modeled simply by placing a single scattered point on it on section 20 (magenta circle). Depending on the sphere radius selected, a scattered point will typically show up on several sections, with the circle becoming smaller away from the central section where the point was placed (the circle is smaller on section 16). A cross is drawn inside the circle on the central section to show that the point was deposited on that section; if this does not make it clear enough you can also make a separate symbol be displayed only on the central section. The type of contours in an object, and the symbols displayed at individual points, can be selected with the Object Edit dialog box. Here are two examples. On the left is a box for the open contour object that is used to track microtubules between sections. A circle is selected for the symbol display, and the symbol size has been set to 7, so that it will be easy to see the symbol when there is only one point on a particular section. 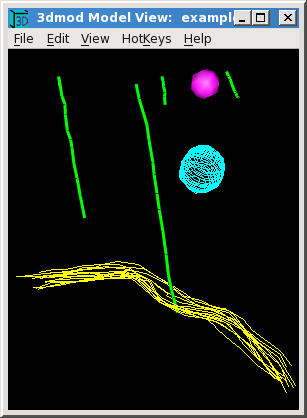 On the right is a box for the scattered point object used to model small vesicles; here no symbol is selected but the sphere radius for points has been set to 14. Several other properties can be set with this dialog. In addition, there is a button at the top to copy the properties of an object from another object, and a button at the bottom to set the properties of the current object as the default for new objects. Model points are added or changed using a 3-button mouse with the program in Model mode. 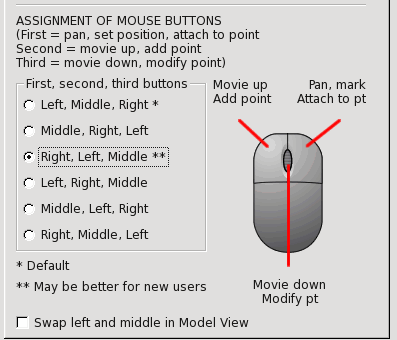 The table below gives an overview of the mouse controls in Movie and Model mode. First Select position or drag mouse to pan image. Attach to nearby model point or drag mouse to pan image. Second Movie image forward, or stop movie. Add new model point or drag mouse to add several points. Third Movie image backward, or stop movie. Modify the current model point or drag mouse to modify several points. See the 3dmod manual page section on mouse controls, and the help pages for individual windows, for more details. The mouse buttons are referred to as "first", "second", and "third" here and in the help pages because these functions can be assigned to different actual buttons. By default, they correspond to the left, middle, and right buttons, respectively. The mapping can be changed in the 3dmod Preferences dialog, opened by selecting Options in the Edit menu (or Preferences in the 3dmod menu on a Mac) and switching to the "Mouse" tab. 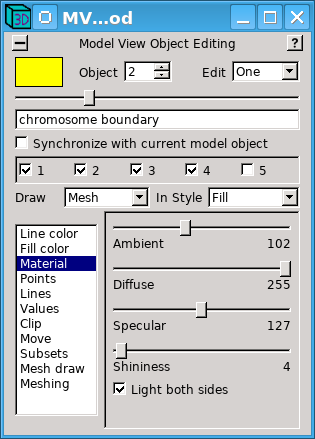 The portion of this dialog in the image below shows an assignment that is similar to most other software, because drawing is done with the left button. New users in particular should consider switching to this mapping, although it could be problematic if you will be receiving hands-on assistance from an established user who is used to the default mapping. Also note that our various tutorials and videos generally assume the default assignments. When you first start a new model or a new object in a model, your first model point will be added to an empty contour. There are two basic ways to add model points to a contour. You can click the second mouse button to add each individual point after moving to a desired position. The other way is to hold down the second button while dragging the pointer over a desired path, which will add closely spaced points along the path. Once you have finished a contour and want to start another one, you need to create a new contour. This can be done with the menu entry Edit-Contour-New, but is much more conveniently done by pressing "n", which is one of many hot keys available to assist modeling. If you are modeling with closed contours, a new contour is created automatically when you switch to a new section and press the second mouse button. When you are modeling with open contours, this does not happen automatically unless you select the option to "Start new contour at new Z" seen above in the Object Edit dialog box. 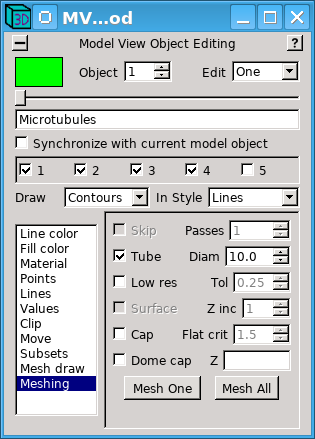 This option is not turned on for modeling microtubules, but it is useful for drawing open contours that are supposed to be confined to one section, such as the ones along the chromosome boundary. As you model, the last point added is left as the current model point. You can change the current model point by clicking with the first mouse button near a point in any contour that is present on the section. This is one way to change the contour or object being modeled. If you click with the first button at a position that is far from any model points, the current point and contour become undefined. If you then add a model point, it will be placed in a new contour, so this is yet another way to begin a new contour. The third mouse button is used to modify existing points by either moving or deleting them. Use this button alone to move one or more points; hold down the Ctrl key to delete points under the cursor while clicking or holding down the third button. 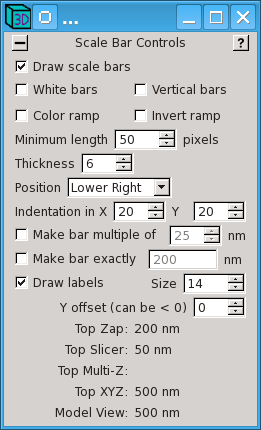 The toolbar for the Zap window has a number of useful controls. In addition to the arrows for changing zoom to fixed zoom values, there is a text box which both displays the current zoom value and allows you to enter any arbitrary zoom. The numbers next to the zoom text box show the size of the window, or of the area enclosed by the rubberband, in pixels in the screen. This could be useful for taking a snapshot of an area of a particular size. The Checkerboard button will toggle between fast drawing and slower, high-resolution drawing, which is now on by default. With high-resolution on, pixels are smoothed by interpolation when the zoom is greater than 1, and the image is filtered before subsampling to avoid artifacts when the zoom is less than 1. The Lock button is used to keep the image from centering on the current point and to allow different Zap windows to display different sections. When the lock is closed, the image will not move when the current model point changes, but it can be moved with the mouse or the PageUp and PageDown keys. When the lock is open, the image may automatically pan to the current point, depending on the setting of the Centering button. This panning does not happen when the current point is selected or added by a mouse button. The Centering button toggles between two centering modes. In one mode, the image will be centered on the current model point only if it falls near the edge of the window, that is, outside of a central box. (Thus, the icon shows one box inside another.) In the other mode, the image will be recentered on the current model point each time you change the current point. (The icon shows a point inside the outer box.) In Movie mode, the image will be recentered on the current image point when you turn the button on. The Insert, or Modeling Direction, button toggles between inserting points before and inserting points after the current model point. This is useful when modeling a feature that passes between sections, in case you need to add points to the start of a contour. The Rubberband button toggles the rubberband on and off. The rubberband can be used for getting coordinates, resizing, setting contrast in selected areas, and file extraction. It can also be used for selecting contours or points that are inside it. The rubberband is initially positioned by pressing the first mouse button at any corner of the desired area and dragging to the opposite corner, and then can be repositioned and resized with first and second mouse buttons. When the rubberband is on, the toolbar changes to include buttons and text boxes for setting lower and upper Z limits (as in the lower image, above). These limits are used for file extraction and at various places in Etomo for selecting slice limits. The Lasso button toggles a lasso contour on and off. When you turn it on, you can then draw a closed contour of any shape with the left mouse button. After the lasso is drawn, it can be moved with the second mouse button. The lasso can be used to select contours or points within the area or to constrain the region displayed in the isosurface display desscribed below.low. The Arrow button toggles a bright, thick arrow that can be useful for pointing out a feature in an image snapshot. When you turn it on, you then draw the arrow from its tail to its head while holding down the first mouse button. The Z slider allows you to riffle through the sections and select a particular one. The text box shows the value of the current section being viewed in the Zap window and allows you to go to a particular section by entering a number. The I button brings the Info Window to the top and prints information there about the image size and location, as well as a command that could be used to extract the image visible in the window or inside the rubberband. Finally, there is a Help button to open a window with help for all features of the Zap window. All image windows and dialog boxes have a Help button to provide window-specific information. The help system consists of a set of html files that are browsable. Here is the help page for the Zap window, and here is an index to all help pages. The XYZ Window shows not just the XY plane but also the two orthogonal planes, YZ and XZ, in separate view boxes. It allows you to movie through the volume in any of these planes independently, and also displays the intersection of the model with each of the three planes. In the example, the XY plane is in the lower left, the XZ plane is above it, and the YZ plane is to the right. The current image point governs which planes are displayed; its position is marked by a small yellow cross in each image panel. 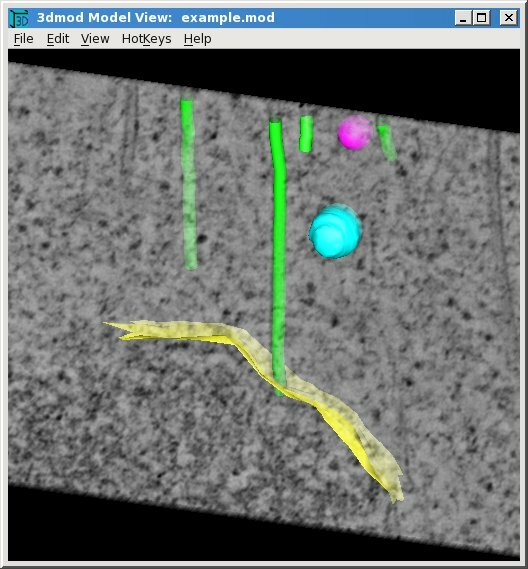 In the figure on the left, you can see the large modeled vesicle in the XZ (top) plane, and an oblique slice through the microtubule marked by the small yellow cross in the YZ (right) plane. 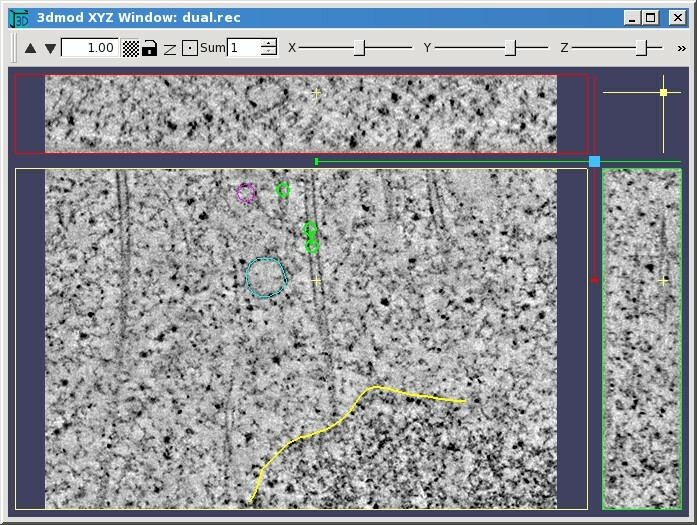 When an XYZ Window is first opened, the window size, the zoom, and the division of the window among the three view boxes are set so that the whole image will appear in each of the view boxes. You can then resize the window if desired, and the program will maintain the same proportion among the view boxes. If you make the window smaller or zoom up, then not all of the image will appear, and you can pan with the first mouse button in any one of the view boxes to bring features of interest back into view. Panning in one plane will typically shift the image in another plane so that all three planes will always show the same feature. If you find that the top and side view boxes are too narrow, which can easily be the case after zooming up, then you can reapportion the window area among the three boxes by dragging the light blue square diagonally with the first mouse button. The toolbar of the XYZ Window has zoom controls, a low/high resolution button, and a lock button as in the Zap Window. The Z button will apply the model's Z-scale factor, if one is set (see below), to stretch out the Z dimension in the XZ and YZ planes. There is a centering button for bringing the current point as near to the center of the view boxes as possible. 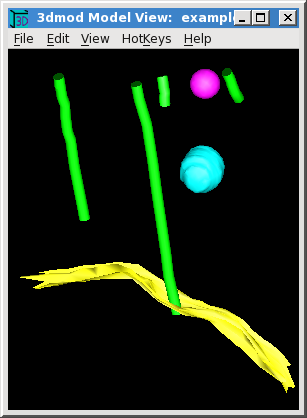 In movie mode, it will center the current image point marked by the yellow crosses; in model mode it will center the current model point. The Sum box allows you to display a sum of images in all of the planes, rather than just a single slice. The toolbar also has sliders for riffling through the X, Y, or Z coordinate. The colored marker lines in the margins of the images also indicate the current point coordinates. They contain small handles that can be grabbed with the mouse to riffle through the images in one plane, as an alternative to the toolbar sliders. The color of the marker line matches the color of the border around the image that is controlled by it; for example, the red line controls the plane selected in the upper panel. PageUp and PageDown keys can be used to step through the planes, as usual, except that these keys step through XZ or YZ slices when the mouse is over the XZ or YZ plane, respectively. Similarly, the arrow keys, which ordinarily step the current image point in X or in Y, operate relative to whichever plane the mouse is located in. In Movie mode, the mouse buttons behave the same as in the Zap Window, and they act separately in the three image panels for selecting the current image point or starting a movie in that panel. Basic modeling can also be done in all three planes, again with the same mouse button functions as in the Zap Window. The display of the model in a given plane is essentially the same as in the Zap window for items drawn in that plane. Items drawn in one plane will show up in other planes to the extent that they intersect the other two planes. Scattered points will show up well everywhere; contours will be hard to see in other planes. The Slicer Window provides a much more flexible view of structures than the XYZ Window because it can display a slice at an arbitrary orientation through the image volume. The orientation is set by adjusting the X, Y, and Z rotation sliders in the second toolbar. In the example, one of the oblique microtubules was centered in the window, then the Z rotation was adjusted to orient the microtubule vertically, then the X rotation was adjusted to bring the microtubule into longitudinal section. Small changes in the X and Y sliders usually cause big changes in the image appearance, whereas the Z slider will primarily rotate the image clockwise and counterclockwise unless X or Y angles are large. When a Slicer is opened, the center of the displayed slice is initially at the current image point, but it can then be panned in the plane of the slice using the first mouse button, just as for other windows. You can step through slices in the direction perpendicular to the displayed slice using the PageUp and PageDown hot keys. You also use the 'View axis position' slider to riffle through slices in that direction. The center of the window is marked by a red cross; this is the center of rotation when the slice angles are changed. There are alternative methods of changing the slice angles which can often be more convenient and intuitive than adjusting the sliders. They involve rotating the volume by increments around the viewing axes instead of directly changing the overall rotation around an axis. You can use the cluster of red arrows to rotate by steps around the vertical or horizontal axis (the straight arrows) or in the plane of the slice (the curved arrows). The size of the rotation step is shown and can be changed with the minus and plus buttons. A second way to rotate by steps around viewing axes is to use the numeric keypad. Ordinarily, the keys there operate on an individual volume axis angle, but if you either hold down the Shift key or turn on the Sh button in the middle of the toolbar arrow cluster, the arrows in the numeric keypad will rotate around X or Y viewing axes and PageUp and PageDown will rotate in the plane of the slice. Finally, if you hold down the Shift key or turn on the Sh button, dragging with the second mouse button will rotate the volume around an axis perpendicular to the direction of mouse motion, and dragging with the third mouse button will rotate in the plane of the slice. 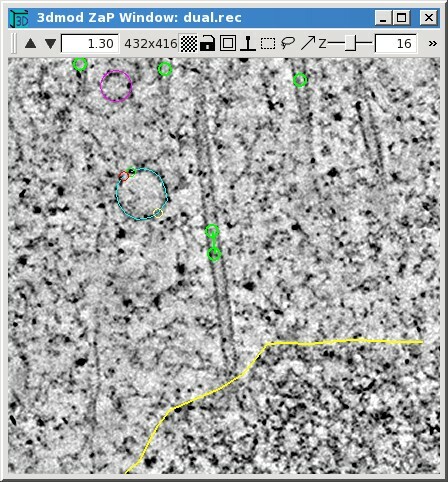 For example, the image in the middle shows the result of dragging with the second mouse button in the direction of the red arrow until some of the microtubules come into good cross-section. 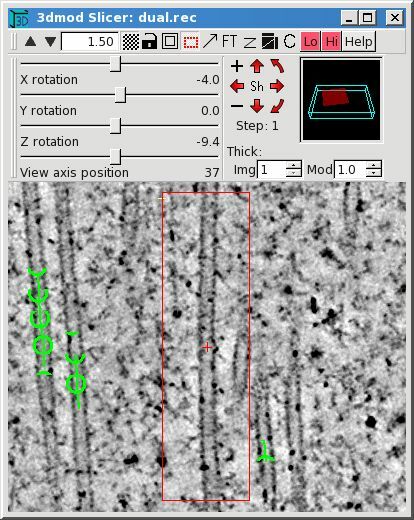 In this particular case, because the some microtubules were already in good longitudinal section, the same result can be obtained by setting the step size to 90 and using the toolbar red up or down arrow. The most useful items in the Slicer toolbars are the following. The black Arrow buttons can be used to change zoom, and the text box displays the current zoom and allows a custom zoom to be entered. The Checkerboard allows you to toggle between rapid, low-resolution drawing using nearest-neighbor interpolation, and high resolution drawing using cubic interpolation. The latter may be noticeably slower, but it will also be more accurate as well as giving a smoother image. The Lock button will prevent the slice position from being moved. There are two main uses for this feature. First, it allows you to maintain a selected view in a Slicer Window while changing to other views in other windows (including other Slicers). Second, it prevents the slow drawing in the slicer from slowing down the program when you want to work in or movie through other windows. The Centering mode button can be used to toggle back to an older mode of operation, where the Slicer was always centered on the current image point and could not be panned. This is perhaps most useful for recentering on the current image or model point, by pushing the button on then off. The Rubberband button allows you to select a rectangular area just as in the Zap window. It can be used for resizing and for extracting a subvolume that is rotated into the orientation of the slice. As shown in the picture on the right, Lo and Hi buttons b buttons appear when the rubberband is drawn; these are used to set slice limits for file extraction. The FT button toggles between showing an image and a Fourier transform of the image. The C button changes the angles to show the slice in which the current contour will appear flat. The box to the right of the arrow cluster portrays the portion of the slice being viewed as a red plane inside of a representation of the whole image volume. The Help button describes hot keys and other features. The image thickness spin box lets you display a slice thicker than 1 pixel thick. The Slicer computes a projection through the number of slices that you select, effectively averaging those slices. The model thickness spin box lets you control the thickness of the slice of model that is displayed on the image. In the example, the circles at each microtubule point are considered to lie in the XY plane and sometimes only a fragment intersects the tilted slice. Increasing the model thickness would make the whole circle show up. If the Ctrl key is held down, the second and third mouse buttons will start a movie in the Slicer window, as in the Zap window. The program will movie through slices in a direction prependicular to the current slice, and will even adjust its direction if you change the rotation sliders while it is movieing. It is possible to model in the Slicer, again with the same mouse button functions as in the Zap window. This provides a convenient way to track trajectories in 3D. Points can be drawn continuously by moving the mouse while holding the second mouse button down. The PageUp and PageDown keys will move the center point by one pixel perpendicular to the plane being viewed, which allows you to draw evenly spaced contours at oblique angles. See the Slicer help page for the more details. The power of the Slicer comes at a cost - it is the first window that we have seen where the computation time can easily make the display unacceptably slow. Display time depends on four factors: image thickness, high versus low resolution, image size, and the number of processors available. The program will take advantage of all processors automatically. If you need to average through many slices with a high resolution display, be sure to make the image no larger than needed. If you must work with a very slow slicer window, remember that the hot sliders can be tamed with the Ctrl key. The Multi-Z window provides another way to view 3D data, by presenting a gallery of slices side by side. With the controls in the toolbar on the right, you can choose how many slices to show, whether to show them in a row, a column, or an array, and the spacing between successive slices. You can also control whether the model is drawn in the middle panel (in the example, it is not), and whether it is drawn in the other panels. This window is a variant of the Zap window and the first toolbar has a subset of the features in the standard Zap toolbar. In order for your model to look right in 3D, you may need to set a property called the "Z-scale" correctly. Both the Z-scale and the pixel size must be set to get accurate quantitative information about the model, because these values are used for calculating length, surface area or volume from object, contour or mesh data. To adjust these fields in the model header select the Model Header menu item from the Edit menu in the 3dmod Information Window. The Z-Scale is the ratio of the thickness between successive images to the pixel size. Its two most common uses are to adjust for section thickness in serial section reconstructions and section thinning in tomography. For serial sections, divide the section thickness in nanometers by the pixel size at which the data were digitized, again in nanometers. For tomograms, divide the original thickness at which the section was cut on the microtome (in nanometers) by the actual thickness of material in the tomogram (pixels of material times pixel size in nanometers). In either case, if you have an estimate of how much the specimen shrank laterally due to beam exposure, you should multiply by the shrinkage factor (e.g., 0.9 for 10% shrinkage). For tomography, the factor should also be adjusted for lost material if you have an estimate of that; see the Model Header help page for a formula. The Pixel Size field should contain both a value for the size of the pixel in the digitized data, and the units for that value. Units can be one of the following; A, nm, um, mm, m, km. For example, you could enter "0.015 um" or "15 nm"; your choice determines what units are reported when items such as distance, length, and area are computed. When a new model is started on an image file that contains pixel size information, this size is assigned to the model. The model has been tilted around the X and Y axes using the arrow keys on the keypad. The model can also be rotated with the middle mouse button, or using arrows and text boxes in the Control dialog box that can be opened using the Edit-Controls menu entry, but the arrow keys are often more convenient. A single keystrike rotates the model by one step. Continuous rotation is started by pressing the keypad Enter key followed by the desired arrow key; another press of the Enter key stops the rotation. If there is no keypad available, you can open a rotation tool with Edit-Rotation and use it just like the arrow cluster in the Slicer window, except that the middle button starts and stops continuous rotation. On the left is the initial view of the model, before any of the default viewing parameters have been changed. These parameters are initially set to show open and closed contour objects with contour line tracings, and scattered points as wire baskets. The middle view shows two changes that can be made immediately, without having to compute surface meshes for the contours. 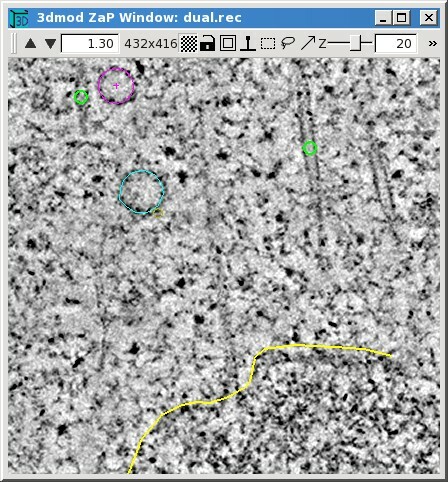 The microtubule lines (green) have been made thicker and the scattered points are displayed as lighted surfaces. On the right is the display after making meshes for the objects (as explained below) and setting all objects to display as lighted surfaces. These display settings are all changed in the 3dmodv Objects dialog box, opened with the Edit-Objects menu item or the Shift+O hot key. The Objects dialog box contains controls for selecting the current object to be edited, buttons for turning individual objects on or off, and a set of panels for setting different object properties or controlling the overall display. A panel is selected by clicking on its name in the list. The example on the left shows how the appearance of the green lines was changed for the middle model view panel above. The "Lines" panel was selected, the 3D line width was increased from 1 to 3, and "Anti-alias rendering" was turned on to smooth out the jagged edges of the lines. The example in the middle shows how the scattered points were displayed as solid objects. The selection for "Draw Data Type" was changed from "Contour" to "Mesh". 3dmod automatically changed "Drawing Style" from "Line" to "Fill" to produce the most commonly desired appearance. The example on the right shows a change that was required after meshes were computed and displayed for all objects. By default, objects are lit only on one surface, which is always the outer surface for closed contour objects. (Note the dark surfaces on the interior of the microtubules.) However, a sheet like the chromosome boundary (yellow) does not have an obvious interior surface, and its lit surface happened to face downward, toward the chromosome. This problem was solved by checking the "Light Both Sides" option in the "Material" panel. The other method of solving this is to go back to the 3dmod Object Edit dialog box and change the "Front Face" from "Outside" to "Inside", then recompute the mesh. The appearance of the magenta scattered point was improved between the middle and right views of the model by pressing the "G" hot key twice to increase sphere drawing quality. When there are many spheres, this degree of quality could significantly increase drawing time for the display, so it is not the default. The sphere drawing quality can also be controlled in the "Points" panel, which allows one to change the global quality setting (just as with the "G" and "Shift+G" hot keys) as well as set a quality for individual objects. The Model View window, like the rest of 3dmod, has many hot keys, which are listed in a help page. Most of them are accessible through the HotKeys menu. When the Model View window is opened from 3dmod, it is possible to display the image data in 3D in this window in two different ways. One way is to draw one or more planes of the image along with the model. Use the Edit-Image menu entry to open a dialog to control many aspects of this image projection. Multiple planes are drawn with enough transparency so that you can see through to the rearmost image plane; you can add more transparency to see the model through the images as well. The following pictures show an example of this display. The other way to display image data is to draw a surface called an isosurface at a particular threshold level. The middle image below shows an isosurface rendering of the two basal bodies whose cross-section appear in the Zap window on the left. Select Isosurface from either the Image menu of the Info window or the Edit menu of the Model View window (or use the Shift+U hot key) to start the isosurface display and open the dialog to control it. 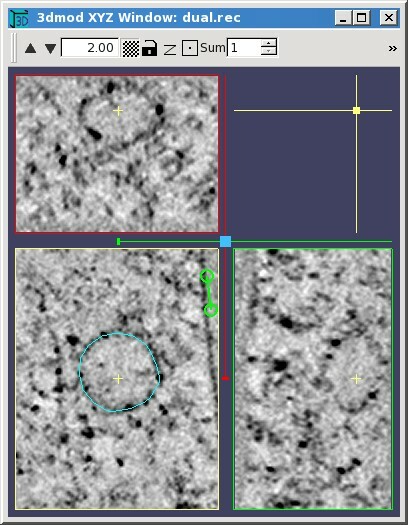 The isosurface display is most useful when looking at macromolecular structures in averaged subvolumes from tomograms, but may also be useful for examining tomograms directly, particularly if the data are binned and small unconnected fragments are deleted from the display. 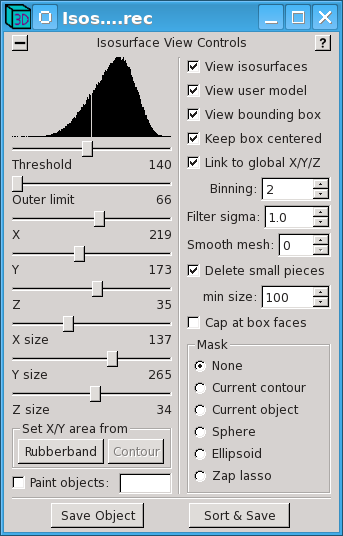 The threshold can be adjusted to isolate features of interest, and the other sliders in the dialog can be used to select the position and the size of the volume being rendered. There are two ways to relate positions on the isosurface to features in the image data. First, if you click on the isosurface with the right mouse button, the selected point will become the current image point in 3dmod. Second, if you turn on the display of the current point in the View menu of the Model View window, you can click on a point in the Zap or Slicer window and see that position marked in the Model View window with a red sphere (as seen above). Both of these methods will work better if you uncheck Link to global X, Y, Z so that the position of the volume being rendered does not change when you click in either place. The display properties of the isosurface can be adjusted from the Edit-Objects dialog just as for actual objects in the model. The isosurface is kept in something called an "extra object" and it is assigned a number higher than the number of actual objects. The isosurface will disappear when you close the dialog, but you can use the Save to Object button to move it into a new actual object in the model. Skinning is the name used for calculating a three-dimensional surface from contour data. This surface, once calculated, is represented by a mesh of triangles that can be stored within each object. If any contour points within that object are edited then the mesh for that object must be recalculated in order for it to match the contour data. There are two ways to calculate the mesh from the contour data within a model: with the imodmesh program, and with the Meshing panel of the Objects dialog box. Using imodmesh provides a wide range of options for controlling the meshing; whereas the Meshing panel provides a more intuitive interface with the most important options. By default, imodmesh will construct meshes only between pairs of contours, which will leave holes at the top and the bottom of a closed contour object because there is nothing to connect the highest and lowest contours to. The "-C" option tells imodmesh to fill in these holes or "Cap" them off. In the model view on the right, the lines of the microtubules appear as tubes because imodmesh created cylindical meshes around them. It did this because of the "-t" option, which is followed by a list of open contour object numbers that should be given tubular meshes (here, just object 1). The "-d" option is then used to specify the diameter of the tubes, in pixels (10). Here, a new mesh is created only for object 4 (-o 4), and points will be skipped, but the surface defined by the mesh will always be within 0.75 pixel of the original data (-R 0.75). In addition, the "-i 2" makes imodmesh connect every other Z plane (i.e., at intervals of 2 in Z), reducing the mesh size by 2. Each time you run imodmesh, the existing file is saved as a backup file with a "~" added to its name. You can also erase all of the mesh data from your model using the "-e" option to imodmesh. Imodmesh also has an option (-l) to store a low resolution mesh alongside a regular mesh, so that a big model can be manipulated rapidly in low-resolution mode then switched to high-resolution mode for studying details. 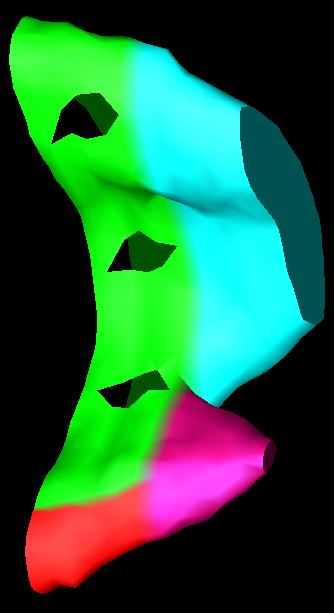 Other commonly needed options are -s and -P to connect contours across gaps; see the imodmesh man page for details. Whenever an object is meshed, either with imodmesh or through this interface, the options used to mesh the object are stored in the model, and their values will be displayed when this panel is opened. This makes it easy to remesh objects without having to remember exactly what options were used previously. On the left, the "Tol" and "Z inc" settings reflects the values entered with the -R and -i options to imodmesh, and the "Cap" checkbox indicates that the -C option was used for the vesicle object. On the right, the "Tube" selection and the diameter are shown for the microtubule object. When the "Make Mesh" button is pressed, the meshing process is started in a separate thread so that you can continue working in 3dmod while the mesh is being computed. If you do mesh with imodmesh while you are modeling in 3dmod, be sure to save the model, run imodmesh, then immediately load the model back into 3dmod with the Reload Model entry in the File menu. To display a scale bar in any of the image windows, or in the Model View window, select the Scale Bar entry from either the Edit menu of the Info window or the View menu of the Model View window. The following dialog will appear. Scale bars will be drawn in the various windows as long as the dialog is open and Draw scale bars is checked. You can select whether the bars will be white or black in the image windows; the bar will always be white in the Model View window if the background there is black. The various controls allow you to adjust the size, location, and orientation of the bars. At the bottom is a list of the scale bar sizes in the various kinds of windows; you will need to record this information when you take a snapshot. 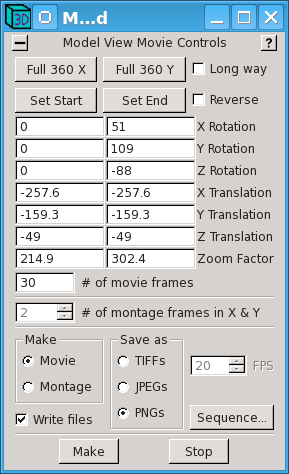 On the left is the dialog box opened with File-Movie/Montage from the 3dmod Info Window menu and used to control movieing and automatic snapshots in image display windows (primarily Zap and Slicer). The sliders at the top allow you to select the range and increment between slices to be snapshot. Here, every slice from 6 to 56 will be snapshot. The Looping radio buttons control how many pictures will be taken when you start a movie. With Round trip selected, pictures will be taken going in both directions, which is useful if your movie playing software will not loop back and forth. If your movie software will loop back and forth, you can select One way and get pictures going in just one direction. The Start at radio buttons allow you to choose whether the set of pictures will start and end at the limits in Z (Start/end) or at the currently displayed section (Current pt). To get a series of pictures, select one of the file formats in the Snapshot box and start a movie in a Zap or Slicer window with the second or third mouse button. The window will stop movieing when the set of pictures is finished. On the right is the corresponding dialog for movies, opened with File-Movie/Montage from the Model View Window menu. In the most general case, you can adjust the model display to the desired starting position, orientation, and size, and press Set Start; then adjust the display to the desired final state and press Set End. Often one simply wants the model to spin all the way around, which is provided by the buttons Full 360 X and Full 360 Y. When you press Make, you will see the model go through its sequence of positions. If it is doing the right thing, select a file format and check Write files, then press Make again. The different image formats differ in their degree and type of compression. TIFF files are uncompressed and can be quite large, since they are 24-bit color. PNG files have a loss-less compression that is quite effective for most model snapshots but much less effective for image snapshots. JPEG files will give the most compression, with some loss of information that can be controlled by the percent quality factor, selectable in the 3dmod Preferences dialog. For images with no model overlay, 80% quality is usually adequate for making movies. If there is a model overlay, you need 90% or higher quality to make it look decent in the individual snapshots (images here were shot at 95% quality). It might be preferable to take such snapshots as PNG's and let your movie software take care of the compression. Note that both of these dialogs have a montage option for capturing high-resolution snapshots that are larger than the image window itself. In each case, the program zooms up the display and pans around to capture a montage of images, then assembles these into a single image and writes a file in the selected format. A movie of such montaged snapshots can be saved from the Zap window or from the Slicer, but only a single frame can be saved in high-resolution mode from the Model View window. This section is to make you aware of some other features in 3dmod, so that you can investigate them when the need arises. Consult the help windows of the relevant dialog boxes, or the 3dmod man page, for more details. The first few items are related to the Surface/Contour/Point window, shown here on the left. Surfaces. Surfaces are an optional level of organization between objects and contours. They are particularly useful when you want to keep track of many components of one kind, without making a separate object for each. Quantitative information can then be derived for each different surface. The top section of this dialog box has some controls for creating and navigating through surfaces, and its help window has more information about them. Open and closed contours. Some of the contours in a closed contour object can be defined as open, which means that their starting and ending points will not be connected. This is useful when modeling a feature that is partially or completely cut by the boundary of a data set. See the imodmesh man page as well as the help window for this dialog box for details. 4D modeling. 3dmod can load multiple image files, which occupy a fourth dimension referred to as "time". Thus, contours in an object can be at different times. Point sizes. Not all points in a scattered point object need to be the same size; individual points can be given different sizes using the controls in the Point section of this dialog box. An option can be selected to use the scroll wheel on the mouse to adjust the point size. There is even a way to draw a closed contour around a feature and have it converted to a scattered point with the equivalent radius (see the dialog box accessed from the Edit-Contour-Move menu entry). Ghost displays. You can project a "ghost" of contours on adjacent sections onto the current section to help you see where to draw the next contour. There are several controls to provide flexibility for different situations. Fine grained display properties. 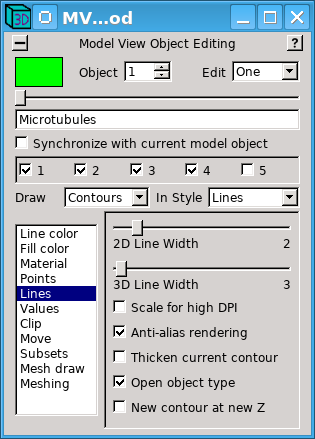 You can control several display properties of points within contours, individual contours, or surfaces using the Fine Grain Control dialog, shown above in the middle. In this example, the window shows the properties of the current point, and all of the properties marked with an "S" instead of a "D" have been set differently for this point than for the rest of the contour. 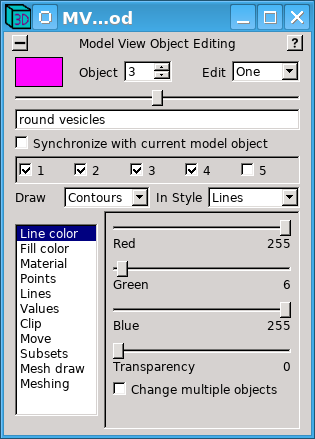 In addition to allowing manipulation of color, line thickness, symbol displays, and transparency, the dialog allows multiple openings to be defined in contours, as shown in the model on the right. For more details see the help page. Model movie sequences. It is possible to set up a series of movies for the Model View window, play them automatically, revisit each one to adjust its properties, and save the movie parameters to a file for reuse later. The dialog for this is opened with the menu entry File-Movie Sequence or with the Sequence button in the Movie/Montage dialog. Here is the help page. Automated modeling. There are two facilities for automated modeling. The Auto Contouring dialog box, opened from the Edit-Contour menu, will draw contours around areas that are above or below a selected threshold of intensity. The Line Track module, opened from the Special menu, will draw contours along a linear feature such as a membrane, either by filling in points between two points placed along the feature, or by copying a contour from one section to the next and adjusting its position to fit changes in the boundary or the object. Drawing Tools, Interpolator, and Other Plugins. 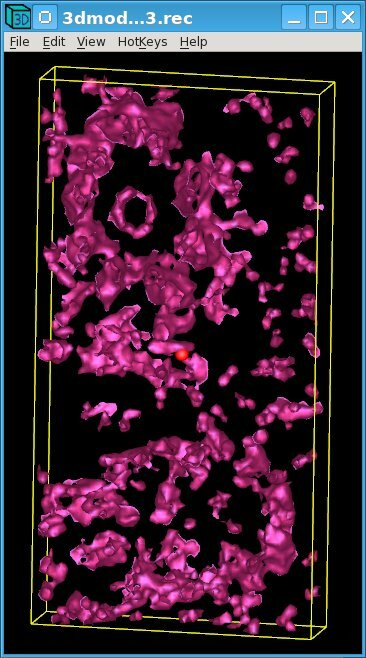 Andrew Noske, originally at the University of Queensland and then at the National Center for Microscopy and Imaging research, has contributed several plugins to 3dmod. Plugins are opened from the Special menu of 3dmod. His plugins provide tools to assist with drawing, tools for making measurements with stereology, help with fixing fiducial models for large data sets, and help managing and assigning standardized names to objects. Jane Ding at CalTech contributed the "Grab with Note" plugin, which allows you to take snapshots of the Zap or Slicer window that have some standard information, and notes that you type in, added to the snapshot below the image itself. Pixel View window. Use the Image-Pixel View menu entry to open a window that displays a grid of pixel intensity values as well as a continuous display of the mouse position in the image and the pixel value at that location. The actual values from the image file are shown in the grid; the continuous display can show either the byte values from within 3dmod or the values in the file. Graph Window. Use the Image-Graph menu entry to open a window that can display a graph of pixel values along a line or along a contour; here is the help page. It is possible to define a line width so as to average over several pixels, and to see the average value over a subset of a line selected with the Zap window rubberband. Locator Window. Use the Image-Locator menu entry to open a window that displays a zoomed-down image of the whole image area, with a red box outlining the area displayed in the active Zap window. You can even click a new center position, or drag the box, to pan the Zap window to the selected location. Here is the help page. Tumbler Window. Use the Image-Tumbler menu entry to open a window that will show a projection through a small volume of data as the volume is tilted to different orientations; here is the help page. File Extraction. After you have defined a 2D region with the rubberband in the Zap window, and also a range of Z sections in the Zap toolbar, select the File-Extract entry in the Info window to extract the selected volume from the image file using Trimvol. Similarly, after defining a region and range of slices in a Slicer window, select the same item to extract a subvolume rotated with Rotatevol. Storing Slicer Angles. Use the Edit-Angles menu entry to open a dialog that allows you save views seen in a Slicer Window. Each view consists of the 3 slicer angles and the center position. You can then set a Slicer to one of these stored views, and go between different views easily. If multiple image files are loaded into 3dmod, different views can be saved for each. This feature could be used to align and toggle between different copies of a similar structure. Here is the help page. Synchronizing Model View and Slicer Windows. It is possible to synchronize the angles of the Model View Window and a Slicer Window so that changing the view angles in one will rotate the other as well. Use Edit-Controls in the Model View menu to open the Controls dialog, and select the checkbox Link to top Slicer angles. Linked Slicers. If you have loaded multiple image files into 3dmod, you can set up several slicers, each one locked to a different time (image file), and link them so that they can be controlled from one window's toolbar. You can even use the Image-Linked Slicers menu entry to open a set of linked slicers automatically, one per image file, and with only one toolbar for all of them. Object color. You can change an object's color using the Edit-Object-Color menu entry from the 3dmod Info Window, as well as using the Edit-Objects dialog box from the Model View Window. Object List dialog. When you have many objects, the Object List dialog is useful for keeping track of and manipulating them. It is opened from the View menu of the Model View window. For each object it shows the name and color and provides a checkbox to turn it on and off. This dialog also allows you to define groups of objects that can be changed together. Here is the help page. Saving views. The Edit-Views entry in the menu of the Model View Window opens a dialog that allows you to save distinct views of the model, which can differ in many features such as orientation, the selection of objects displayed, and object properties such as color and lighting characteristics. Once you have saved the views you can switch between them easily. Editing contours. The Edit-Contour menu has a number of advanced editing features, including ones to move or copy contours from one object to another, and ones to break and join contours (see the help for contour moving, contour joining, contour breaking, and contour copying). Multiple selected contours. It is possible to select more than one contour; this is useful for several operations such as deleting, moving, or joining contours. Multiple selection is done with the Ctrl key (Apple on the Macintosh), such as Ctrl and first mouse button to add a contour to the set of selected ones, and Ctrl-A to select all contours on a section in the current object. Image processing dialog. The Edit-Image-Process menu entry opens a dialog box that allows you to process one section of the image. You can take an FFT or apply a number of filters such as Fourier filtering, smoothing, and median filtering. The dialog can store a sequence of operations and apply them to the whole image file or a selected portion of it. Here is the help page. Caches and image pyramids for large image files. 3dmod has two kinds of caches for working with very large image files, described in the sections "The Full-slice Image Cache" and "The Tile/Strip Image Cache and Image Pyramids" in the 3dmod man page. By making a set of copies of a volume at different resolutions, called an image pyramid, it is possible to access any region of a very large file relatively quickly. Tooltips. If you leave the mouse over a button or other control for over half a second, a tooltip will appear for that control.